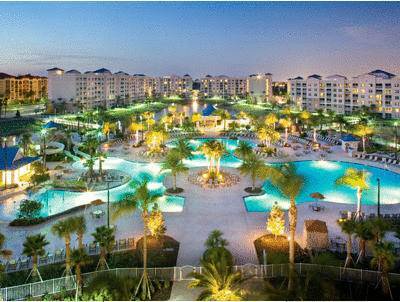 Let the destination reach you at the Bluegreen Vacations Fountains, Ascend Resort Collection hotel in Orlando, FL near SeaWorld and Universal Studios Florida. Take in the sunshine and enjoy nearby attractions like Walt Disney World, Orlando Premium Outlets, Islands of Adventure, and The Mall at Millenia and Epcot Center. Guests can unwind with hotel amenities like free WiFi, free parking, a business center, a computer with Internet access and copy and fax services. Relax in your room which features a fully-equipped kitchen, flat-screen HDTV, safe, hair dryer, iron and ironing board. Also, earn rewards including free nights and gift cards with our Choice Privileges Rewards program. We are a cashless resort and a major credit card will be required upon check-in. Upon booking your reservation, there will be a one night deposit charged for first night's stay. Cancellation policy may apply. The CHI gift Card Program is not available at this location. There is a Resort Fee of $12.51 USD per day, which gives you access to the resort amenities.